A brilliant red sun hung over the horizon this morning as temps hovered around the freezing mark at 31°F. Scattered flurries wet windshields, though no accumulation on the land. The Hudson Bay remains calm and ice-free. Out in the CWMA on the tundra, Guide Sandra and her group followed a Gyrfalcon out to Gordon point as it searched the land for a meal. Guide Elise and Guide Brad and their travelers meanwhile roamed around Halfway Point area and found 11 bears. One big male they dubbed “Snaggletooth,” stemming from a disjointed tooth protruding from his lip. Sparring with another male may have accounted for this. A Ringed Seal reclining on a rock out off the coast kept a watchful eye on the shore in an effort to not become the lunch special of the day. Any bears venturing out in that direction would be walking on thin ice for sure. Brad’s folks caught up with another two Caribou and a Snowy Owl as well. Approaching the point, two healthy Caribou were spotted grazing on any remaining greenery rich in protein, stockpiling energy in fat reserves for the approaching winter. Once winter hits, the Caribou will dig through snow to reach grayish or yellow-green, root-free lichen in the Cladonia family aptly named Caribou Lichen. The four species of Cladonia in the Churchill area are rich in sugars, about 90%, providing the animals with necessary energy and sustenance to carry them through the harsh cold winter. After a fulfilling afternoon of eight bear sightings, the group wound back along the trail to launch under unexpected sunny, blue skies. 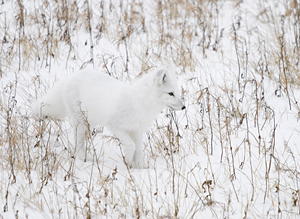 Guide Scott reported no openings in the cloud cover later in the evening as his travelers were fortunate enough to observe one of the rare Arctic Fox displays of the season. This fox circled their evening rover for a good 10 minutes. All in all, another stellar day in Churchill.